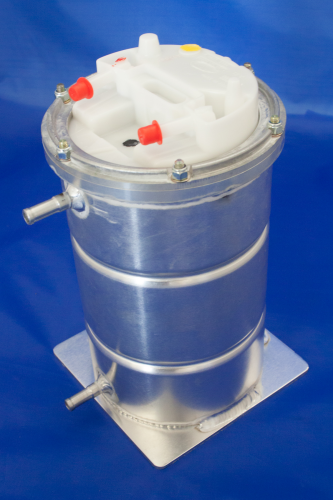 When converting a vehicle to electronic fuel injection you have to consider adding a swirl pot to prevent fuel starvation and a high pressure fuel pump to meet the requirements of the new system. The swirl pot is hand made from lightweight alloy and comes with a blank mounting base that can be drilled to suit. 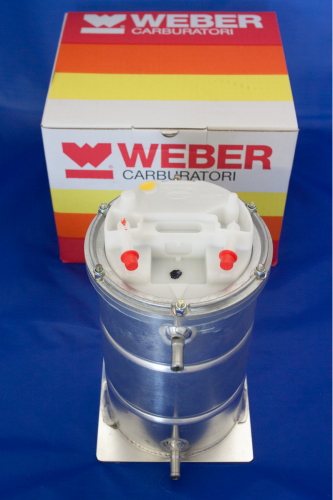 The high pressure fuel pump is based on the outstandingly successful Webcon WFP096 fuel pump and is a perfect fit inside the swirl pot to keep overall dimensions to a minimum. Low pressure fuel from the original tank is fed into the lower side inlet, and excess fuel and vapour is fed back to the tank via the Upper, restricted outlet. The high pressure feed and return are Neatly contained on the top of the unit along with the electrical Connection. WFP600 is especially useful when converting a classic car to EFI as there tends to be little room available to fit a seperate fuel pump and swirl pot.